The Group has presented selected line items from the consolidated statement of comprehensive income and certain trading profit metrics on a constant exchange rate basis in the tables below. The pro forma constant exchange rate information is presented to demonstrate the impact of fluctuations in currency exchange rates on the Group's reported results. The constant exchange rate report is the responsibility of the Group's Board of Directors and is presented for illustrative purposes only. Due to the nature of this information, it may not fairly present the Group's financial position, changes in equity and results of operations or cash flows. The pro forma information has been compiled in terms of the JSE Listings Requirements and the Revised Guide on Pro Forma information by SAICA and the accounting policies of the Group as at 30 June 2018. 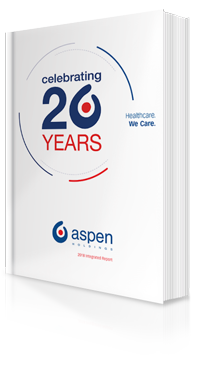 The illustrative constant exchange rate report on selected financial data has been derived from the audited financial information and has been reported on by Aspen's auditors in an assurance report, which is available for inspection at the Company's registered office. The Group's financial performance is impacted by numerous currencies which underlie the reported trading results, where even within geographic segments, the Group trades in multiple currencies ("source currencies"). The constant exchange rate restatement has been calculated by adjusting the prior year's reported results at the current year's reported average exchange rates. Restating the prior year's numbers provides illustrative comparability with the current year's reported performance by adjusting the estimated effect of source currency movements. For purposes of the constant exchange rate report the prior year's source currency revenue, cost of sales and expenses have been restated from the prior year's relevant average exchange rate to the current year's relevant reported average exchange rate. Net interest paid is directly linked to the source currency of the borrowing on which it is levied and is restated from the prior year's relevant reported average exchange rate to the current year's relevant reported average exchange rate. The tax charge for purposes of the constant currency report has been recomputed by applying the actual effective tax rate to the restated profit before tax. Comparative figures have been restated to conform with changes in presentation. ^Calculated in accordance of the Group's long-term debt agreements. Operating profit before depreciation and amortisation adjusted for specific non-trading items as defined in the accounting policies of the Group's annual financial statements.